Have you ever had an interaction with someone where you felt compelled to share the story with others afterward? Last week, I was contacted by a salesperson, and the communication between us was so interesting that I’m sharing it in hopes you find some useful tips to apply to your client interactions. Out of the blue, I received an email from a salesperson saying someone from his organization (that knows me and is familiar with Sales Maven) passed along my name and contact information. Here’s his initial email to me (with a few minor changes to keep his name & organization private. Based on those two things, I replied letting him know I’d be interested in setting up a phone call. However, the two times he gave me didn’t work in my schedule. I emailed that I’d be willing to set up a time to chat on the phone and gave him 2 options that worked in my schedule. Based on his reply I was a little put-off. I’d let him know I preferred a phone call over meeting in person. For him to come back and tell me what he preferred sent the message he was more interested in what worked for him, instead of what worked for me (and I’m the potential client). My response back was that I’m not interested in meeting in person due to my busy schedule so I’d pass on meeting with him. At that point, it felt pushy (were you on the live teleclass I offered last week Get More Clients Without Being Pushy if not, you can still register and listen to the training). He’s ignoring my requests. Had he replied we could set up a phone call, I would have scheduled one with him. Instead, he continued to insist we meet in person. Look, I know in sales, meeting in-person is generally more successful than email or phone conversations. 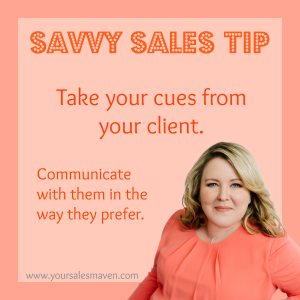 However, when your potential client (with whom you have zero rapport) tells you they’re willing to give you time, and they prefer the initial conversation over the phone, set up a call. Pushing back and telling a prospective client what you prefer is not only irrelevant, it’s a rapport breaker. Had he agreed to the initial phone call, he would have had a chance to build rapport and create more curiosity about his service that might have led to an in-person meeting and ultimately to earning my business. Instead, I decided it’s not worth my time and energy to engage with him. Your sales tip is to take your cues from your prospective client. When they tell you they’ll meet with you over the phone, set up a phone call. When they tell you they prefer you communicate with them via text message, then text them. It’s your job to earn their business, not the other way around. It’s not their job to accommodate you and your preferences. Remember, make it easy for your prospective clients to do business with you. The easier you make it, the greater your chances of earning their business. Join the Sales Maven Community now. ( 2012.02.9 12:28 ) : I wanted to draft you the very small word so as to thank you so much the momnet again with your pleasant advice you’ve provided above. It has been so remarkably generous with people like you to convey extensively exactly what a few individuals might have offered for sale for an e book in making some bucks for themselves, most importantly considering the fact that you might well have done it if you considered necessary. Those advice in addition worked like a easy way to fully grasp that many people have the same dreams just as mine to know lots more pertaining to this issue. I’m sure there are some more pleasurable momnets in the future for folks who scan through your website.